Hi there! 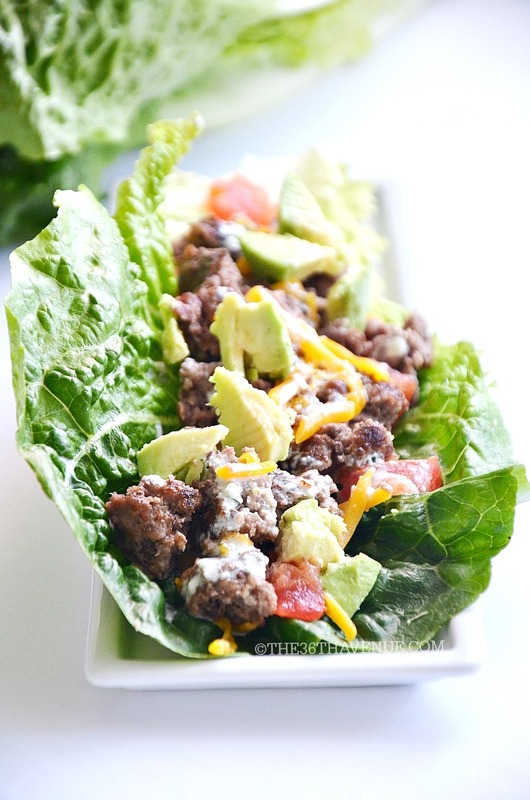 Ready to see how I made this delicious Cheeseburger Lettuce Wrap? This is a great low carb recipe, it’s super tasty, and you can have it ready in less than 10 minutes. I used ingredients that you can just grab from the fridge, and put together with little effort… So good! For this recipe I used Quick’N Eat Angus Choice Beef Patties. These patties are 100% beef and they come fully cooked. They are super handy when you are in a hurry and want to make something quickly. I just throw them in the microwave for a minute and they are ready to go! I like to use heart Romain lettuce because the leaves are the perfect size and they have a natural curve that holds the ingredients pretty well. 1. Chop tomato in half and avocado into small cubes. 2. Wrap beef patty in a paper towel and microwave for one minute. Cut it in bite sized pieces. Sprinkle with cheese while it is hot so the cheese melts on top of it. 3. Place the hamburger on the lettuce. Top with tomatoes, avocados, and favorite dressing. I love how light and yummy this cheeseburger wrap is! Here are other quick recipes that we love! This is my husband’s favorite sandwich… So darn good! These salads are so good! You can serve them as side dishes or as your main dish! Healthy has never looked so good!